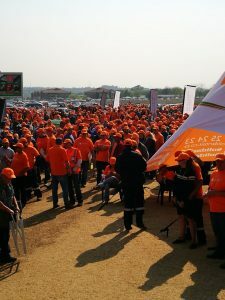 Today thousands of Sasol employees in Secunda went on strike and made their voices heard in protest against Sasol’s Khanyisa share scheme that excludes white workers simply because of their race. According to Solidarity Chief Executive Dirk Hermann, these workers made their voices heard today by taking a stand. “What Sasol is doing, is unfair to workers who helped build the company and who have been loyal and faithful workers throughout the years. Today, thousands of workers taking part in this strike said: Enough is enough,” Hermann said. According to Hermann, the community also turned up in large numbers and joined the strikers in order to show their support for the workers and to add their voices to the protest action. “Workers have reason to be angry for being excluded by Sasol because of a principle exclusively based on race, and they are prepared to make their voices heard for what they believe is right and fair,” Hermann said. “The fact that the community and everyone affected by this unfair situation are taking a stand for what they believe is right, is incredibly encouraging. It shows that this is an involved community prepared to take a stand as well. Their actions encourage and energise us,” Hermann said.